Sorry, this is not the topic, but is perhaps the best place to put this at the moment. I heard a person say ski places in lower elevations in Europe have closed in recent years because of lack of snow. I wonder if this has happened? But, I also imagine some places might be closing because of better alternatives for skiers and families. That is, have less attractive places closed as other resorts developed more and better facilities? I think, in the USA, some places are adding attractions indoors to earn extra money beyond what they get from the ones on the slopes. Yes, the small hills in lower elevations often lack sufficient snowfall to justify continued investment in infrastructure and maintenance. Those that have done so nevertheless find that that the by the end of the season, they don’t cover the bottom line. Resorts with a higher base elevation have a much better chance of survival. This is so obvious to see, that finding examples is hardly worth the effort. The larger resorts, particularly with access to a larger mountain (including the higher elevations) can and do attract both local and far away tourists. There is also a marked, long-term trend toward higher end wellness resorts combined with winter sports. That said, this winter has brought pretty healthy snowfall, even down to the lower elevations (though the snow hasn’t stayed in the valley floor for too long). If winters over the next several years show consistently more snowfall as well as cold temperatures below 1000 m elevation, perhaps some of the Ma & Pa resorts might get an opportunity. 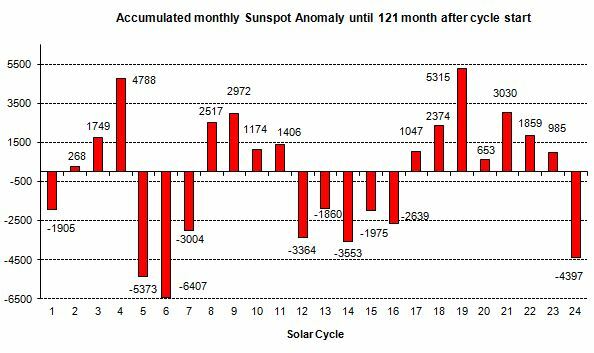 If, as so many scholars studying the sun surmise that there is a possible 6-18 months more of very low sunspot and solar output, with rising opportunities for cosmic rays to impact on the planet, then the short term (decadal) global temperatures are very likely to see a heavy downward trend. Are the advocates of the UN-IPPC cAGW (aka Climate Change™) in deep denial of these observations, or just entrenched in complete intellectual oblivion. One trend tgat stands out to me is, once the SSN anomolie for a cycle changes (+/-), it stays that way for at least the next two cycles. So the sun is likely quiet for another 20 odd years. Yes indeed , it seems to be a “cluster development” which shows itself in this kind of presentation. Very likely the next cycle (25) will be weaker than normal not only deduced from the solar polar fields ( see text of the post) but also as a result of the “law of the numbers”. A single outlier could be extremely rare. Why people are even concerned about it getting hotter or colder is beyond me. I don’t care because it makes Zero difference. Humans adapt…full stop. Bondi was beaut this arvo. Plenty of little waves going nowhere near taking out the Beach which has been there for millennia. It was going to disappear according to a prediction from some dumb arse Ozzie of the year about 10 yrs ago. It is like this. It’s summer… it gets hot..wear less clothes. Its’ winter, it gets cold…get a warm blanket. Simple Really! Exactly! Enjoy yourself Steve, lest all the doom-mongers get you. Jacob Bronowski made that point clear early in his video series. He pointed out most animals are specialists for their particular environment with limited degrees of adaptation. Humans in contrast are not particularly specialized for a particular environment but are very adaptable because some of them can think and reason. These days not many people seem to appreciate the importance of that part of our human nature — to probe, question, test, experiment, and communicate. We remember events and use what has been witnessed as knowledge for ideas for why things happen, or why other events are different. However we are not merely librarians of the nature, cataloging our world and the universe about us, we are active discoverers of how the universe is, and how we are. We degrade ourselves and others when we are lazily satisfied with cataloging the known, pigeon-holing ‘facts’ and never inquiring further. The words ‘settled science’ are an affront to man’s basic nature and instincts, you might as well say ‘there’s no new music’ because all the combinations of notes, timbres, and rhythms that can be made, have been played. 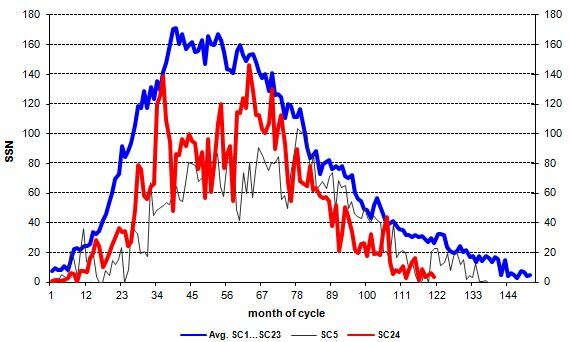 Cycle 24 may just be the start of the something much chillier like the Dalton minimum of cycles 5,6 & 7. That is the clear message from the research of Professor Valentina Zharkova whose work on the physics of solar magnetism predicts a modern grand solar minimum in solar activity from 2020-2053 when two parts of the sun’s magnetic field cancel out. This is playing absolute hell on amateur radio. Not if you operate on the low bands….. Simple question. Because of modern tech, do we see more of the very small sunspots now, rather than they did with the tech of the Dalton Minimum? Or is it more or less the same? We “see” more but supposedly the count is adjusted to it retains historic continuity. I live near the small ski resorts of the Southern Alps of France. I can tell you that the stations have remained open. The snow, which may be absent in December, was present in January, February and even March. J’habite à proximité des petites stations de ski des Alpes du Sud de la France. Je peux vous affirmer que les stations sont restées ouvertes. La neige qui peut être absente en décembre, était bien présente sur les mois de janvier, février, et même sur les mois de mars. Interesting link you have posted there. Something on the inventor in English. Also found on your site, an article on Jeremy Rifkin. NOT one of the good ones. Why? Because of the very bad advice he’s giving. Like getting advice from a Vegan on how to improve the quality of your beef.